It is the day before Christmas Eve and K.C. is on his way from New Jersey, Amanda is working her last shift at Outback until after Christmas. I am so excited to have my children home and give them their Christmas presents! I still enjoy finding the perfect surprise gift for them, I still enjoy celebrating the Holiday with them. I think I enjoy the holiday just as much as when they were little. Karl is making up the toppings for the wood fired pizza we will have tonight! Tonight seemed like the perfect night to make pizza. We wanted something easy and pizza is so easy, we wanted something special and pizza in our brick oven is always a special treat. Karl is in charge of the whole deal tonight and he made a new pizza dough recipe that I will share with you. In fact Karl and my children will be making all the holiday meals this year! I think having this cast might be not so bad after all. I am thinking this could start a whole new tradition in our house! I want to wish everyone a wonderful holiday! We have done so well with our Round Boy Ovens this year! 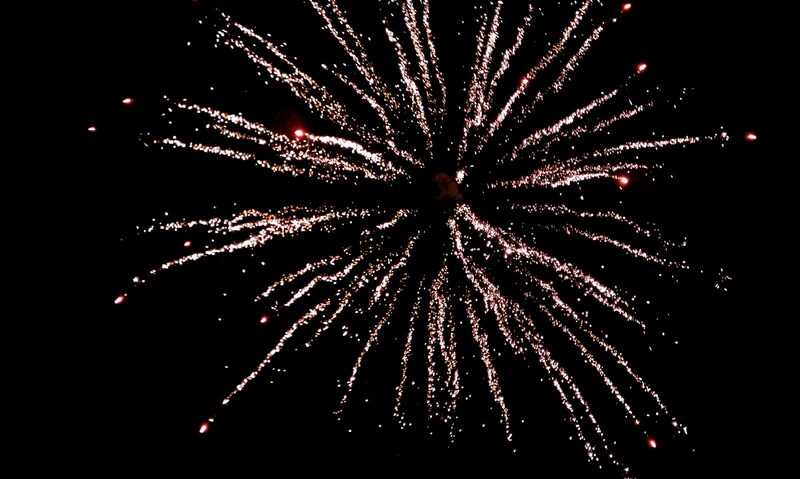 It has been a exciting and successful year for us and we are looking forward to a web site that K.C. is working on with a web designer and maybe some new design features that Harry and Karl have planned. I hope everyone who owns a Round Boy Oven is enjoying some holiday brick oven meals! I would be so happy if you would share with me your favorite recipe for me to post for everyone. 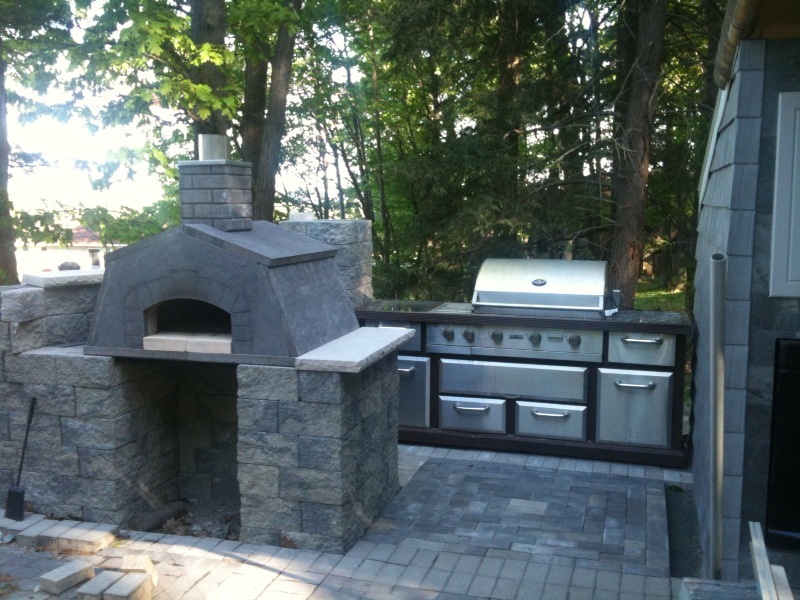 We will also be sharing on the web site the very creative designs our customers have used with their Round Boy ovens. We appreciate and have enjoyed talking to all our customers and future customers this year. The best part has been the people we have met! So I hope Santa is good to you all and next year is healthy and happy! Stir warm water, yeast , sugar and salt in bowl. Set aside for 5 min. for yeast to foam. Add flour and olive oil to yeast mixture. Attach dough hook and stir at med. speed until combined. Continue beating at med. speed for 7 min. Wipe a clean large bowl with olive oil and place the dough in bowl turning so all sides are coated. Cover with plastic wrap and set aside in a warm draft free place( I use the microwave) for about 2 hours or until doubles in size. Shape and make dough balls the size you need ( I like 10 oz.). Enjoy! Chef Karl and Pigs in a Blanket! I have a great husband who reminds me to be positive. I have a great partner and co workers and they have kept our salon running during Christmas and have taken care of my clients holiday hair needs without missing a beat. I need practice at not being in control and a month in a cast should do it. My husband Karl is really a good chef and will try anything in a brick oven because for him that is the way to cook! 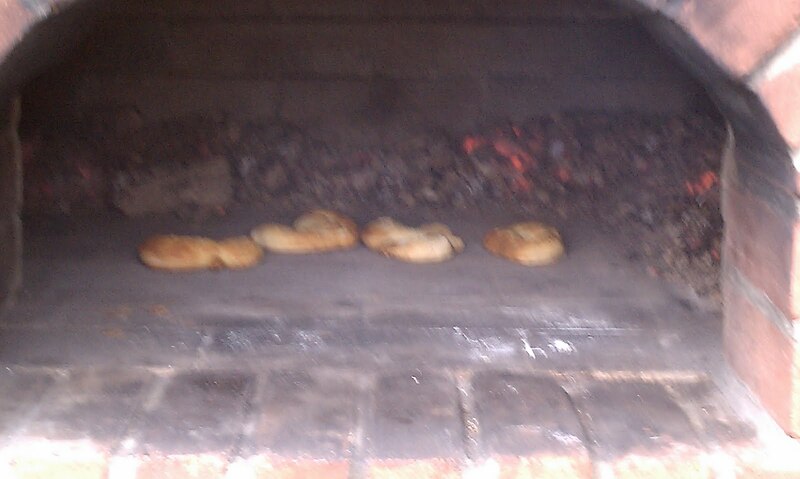 So here is how Karl made "Pigs in the Blanket" and they are done in our brick oven. First boil water and Blanche the cabbage to soften the leaves. Removing the outer leaves as they soften. mix together ground beef, ground pork, eggs, onion, rice and salt, pepper and allspice. roll ground beef mixture up in the cabbage leaves. Layer in a oven safe pot ( we used a ceramic dutch oven) starting with tomatoes then "piggies" ending with Tomatoes. Top with 4 slices of uncooked bacon. The oven: Bring brick oven to white hot and let cool down to 400*. Place pot in oven, we did not use a door but kept a small fire going to keep oven temperature around 400*. Karl turned the pot every 1/2 hour and he timed them for 2 hours. I wanted to try roasting a turkey in the brick oven all summer. We never got around to trying a turkey in the oven because we enjoy pizza and steak so much! Roasting a turkey on Thanksgiving when we have guest for dinner was a little scary. The solution was a turkey breast done in my Jenn Air and another breast done wood fired outside in our brick oven. Both took about the same time and both had the same preparation and seasoning. The breast was a honey brine fresh turkey breast from Wegmans. I used a seasoned rub. The results were told by the fact that the only leftover turkey was the Jenn Air roasted breast. The wood fired breast was amazing! I wish you could taste the difference yourself because I do not have he words to describe the flavor! I loved that it would free up my Jenn Air for other dishes. I loved that Karl and Amanda were in charge of the brick oven and it was one less thing for me to think about. I loved how great it tasted! 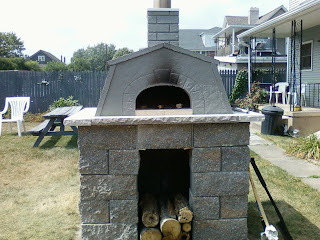 I am still amazed out how good everything comes out when we make it in the brick oven. We really enjoy this oven as a family. I am so happy that it brings my kids back home! Karl and I are not big vacationers and having something else we enjoy in our back yard for us is better then going away on vacation! Karl brought the oven up to white hot (bricks on top of oven inside turn white). He let the oven cool to 475* to 500* and kept a small fire going while roasting the turkey. He did not use a door on the oven. I coated the turkey with olive oil and used a seasoned salt rub. I placed the turkey on a rack in a roasting pan and covered with foil. Karl turned the turkey every 1/2 hour. He removed the foil the last hour to let the turkey brown. It roasted for about 3 hours and a internal temperature of 165*. We let it sit for a 1/2 hour and sliced. The turkey was a little pink by the skin because it was wood fired. Charlie taking a break from watching the brick oven to enjoy the snow. 2nd Annual O'hara Orchard Cider Making Day! This Round Boy Oven should be retired to the museum! The deer will love this! Lots of apples to go! Thanks Chris and Joe for a great Fall day! Chicken under a brick seemed very interesting to me when I read the recipe. It came from my favorite wood fired oven book - THE ART Of WOOD FIRED COOKING by Andrea Mugnaini. We also made roasted asparagus and roasted potatoes from the same book. What a feast we had! The preparation was so easy and the clean up even easier for a meal that looked and tasted like we spent hours. The tricks to the chicken were to have a whole chicken deboned by the friendly butcher at Wegmans and the Aromatic salt recipe from the book. The fire was easily managed and all of this was in the book. Oh and the bricks on top of the chicken was the best trick! We started with our roasted potatoes first because they took about 30 minutes. The chicken was next heating the bake sheet in the oven first then adding the chicken with 2 bricks covered in foil on top for the first 15 minutes. We removed the bricks and roasted for another 30 minutes. Last we put in the asparagus! The next time I make this meal I will use smaller pans and keep the potatoes and chicken in the oven farthest from flame while the other items roast. This time I took them out and put in my regular oven to keep warm. Place salt and herb mixture on a sheet and toss together. Hold lemon over salt mixture and zest. Toss again. Mixture can be used now or dried at room temp. for 48 hours and kept in fridge for use later. A beautiful Fall day a brick oven and apple dumplings! Enough said! Cut shortening into flour, salt and baking powder. Add milk. 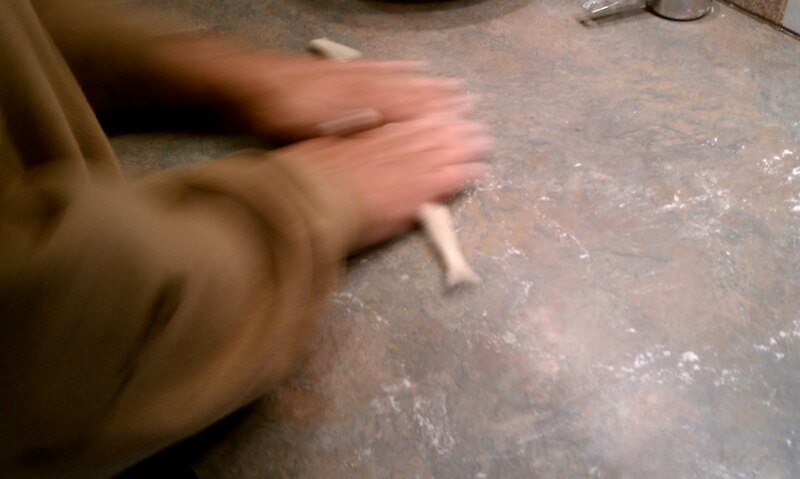 roll onto a floured counter into a rectangle. Cut into 6 squares. Core and peel apples. Place apple onto a square of pastry. Pull opposite corners up to meet and fold pastry over apple, crimp edges. Place in a 9x13 baking dish. Bring to a boil. Pour sauce over dumplings. Bake at 375* for 35 to 40 minutes. Oven prep. 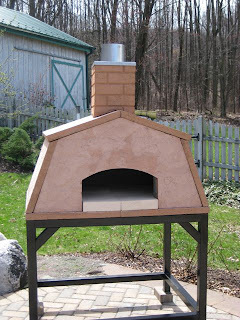 Fire oven until dome turns white. Take the fire out and put the door on and block chimney. Wait 1 hour for the heat to even out and cool down to 425*. We baked the dumplings uncovered in 13x 9 pan for 45 min. with the door and chimney closed. The apples were still a little crisp. Coney Island Catering in my backyard! Today Karl and I had a nice treat when Coney Island Catering came by to check out our Round Boy Oven. They were kind enough to bring all the ingredients and make us their wood fired pizza in our oven! WOW! These boys make a good pizza! 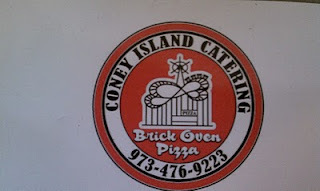 They gave me all the tricks to a great wood fired pizza the Coney Island way. 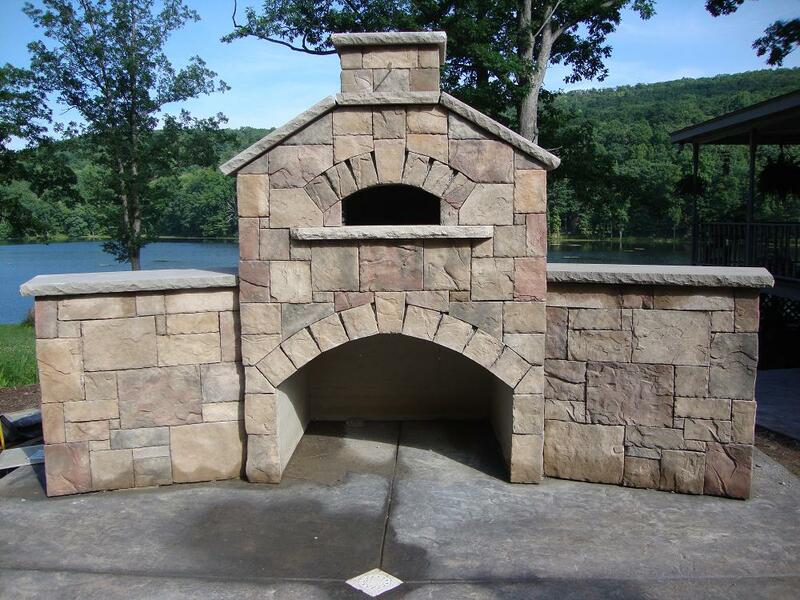 They have a wood fired pizza oven that they take on the road and cater events. What a great business they have. I really enjoyed the afternoon with such hard working entrepreneurs who have the recipe for success! They even left me the ingredients to make pizza for K.C. tonight when he gets home from New Jersey. 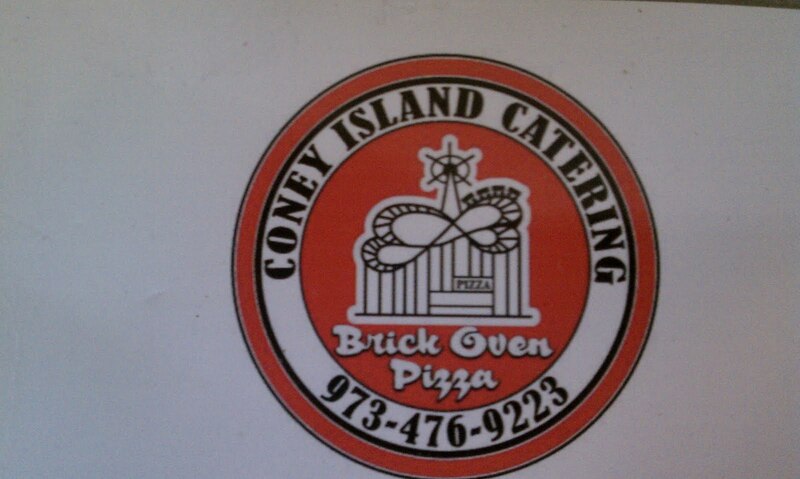 Coney Island Catering caters in New Jersey and New York and you can check them out at http://www.coneyislandcatering.com/ and be sure and check out their face book page and the events they will be serving pizza at. I know Karl and I will be making a point to attend a event they cater the next time we are visiting K.C. We have been having a lot of fun starting our new business Round Boy Outdoor Products. I am thrilled that our ovens are making their way around the country! I love meeting new people and exchanging recipes and ideas. I like what Jed from Coney Island Catering said about pizza " There is no wrong way to make a pizza, everyone has their own way they like pizza!". I agree and it is really fun trying all the different styles of pizza. If only pizza was zero calorie! I finally found 00 flour! The difference in my pizza crust was amazing! The first difference was how nice the dough pressed out. No rolling pin was needed! Karl had a little trouble sliding the pizza off the peel and into the oven even with a corn meal dusting. The next difference was how wonderful the dough baked and the last difference was the taste! Crispy and sweet! What a pleasure the dough was in preparation and taste. 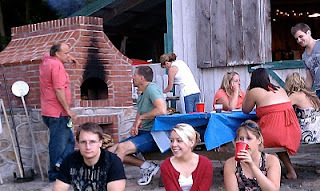 Karl,Amanda and I had a feast and we felt sad for all the people in the world without a brick oven in their backyard! I am sharing the recipe and pictures of the best pizza to date in our backyard! The recipe again comes from Peter Reinhart and if you have a Round Boy Oven you need his books American Pie and The Bread Baker's Apprentice. I mixed all ingredients in my Kitchen Aid Mixer. Mix until dough cleans side of bowl and sticks to the bottom of bowl. The dough should be tacky not sticky. I did need to add more flour as the dough was very wet. I divided into 3 equal balls coated in olive oil and put in zip lock bags. I let sit out for 15 minutes and the put in refrigerator over night. I took the dough out of the refrigerator 2 hours before making the pizza. The dough was perfect! I know this sounds like a lot of work for pizza but it took 20 minutes of prep on Thursday night to make the dough and the hardest part on Friday after work was remembering to get the dough out 2 hours before we wanted to make pizza! Creative Round Boy oven owners! 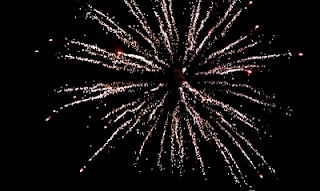 This 4th of July the party at my house was my kid's party! As I looked out across my yard at these adults that I watched grow I thought about how independent they are! My son a C.P.A. and my daughter graduating next year from college and already doing her internship. Frank, my son's friend since playschool, working in accounting, living in Philadelphia. He has a really sweet girlfriend and I must say I am proud of him! Ray is on his way to Law School already has a degree in accounting. He also is living in Philadelphia! I am proud of him! Andy working towards becoming a doctor, Wey working in computers! I am proud of all of them! I am so thankful that after growing up and becoming" Independent " my children still like to hang out with Karl and I! They like to bring their friends over and hang out with my friends! This is a great time for Karl and I, we do not have as much responsibility towards our kids. They have become are friends and we really do enjoy them! I like how "Independent" they are! I like having them around! The day after the Party I noticed someone wrote on my blackboard "Karl and his family Rock". I laughed and thought no! You kids rock and you can come here anytime and hang out! You are probably wondering what this has to do with a Brick Oven? 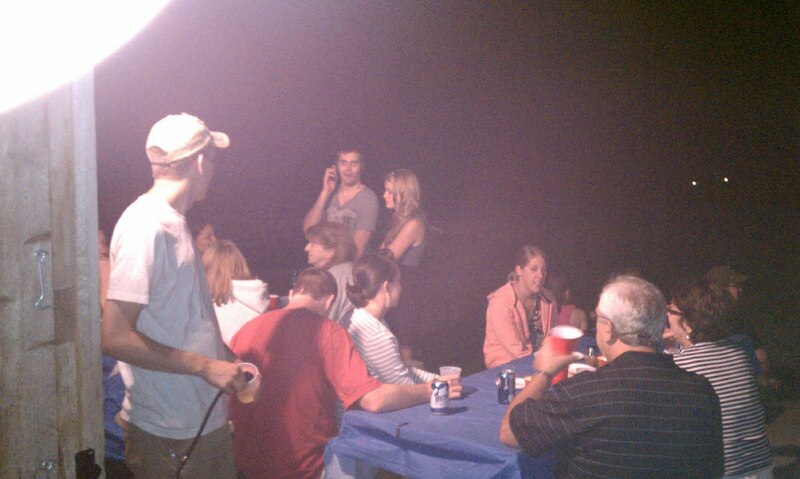 The party of course was around the oven. We served 20 Pizzas and the oven was the main attraction! We had Lillian, Franks mom, baking pies! George had a shift at the oven! Joe, of course always eager to help me with the pizza! 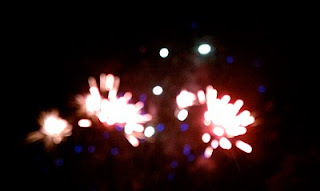 The Fireworks were awesome thanks to Frankie and K.C. 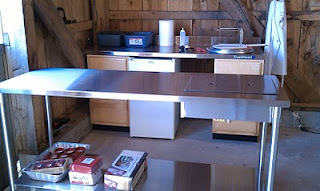 I want to thank Craftmetal for making a pizza prep counter for me! I really like the insulated well for my toppings! I love being able to make pizza in the barn next to the oven! Is That A Wood Fired Soft Pretzel? I woke up to a dreary cold day with a north wind (according to the weather man)! 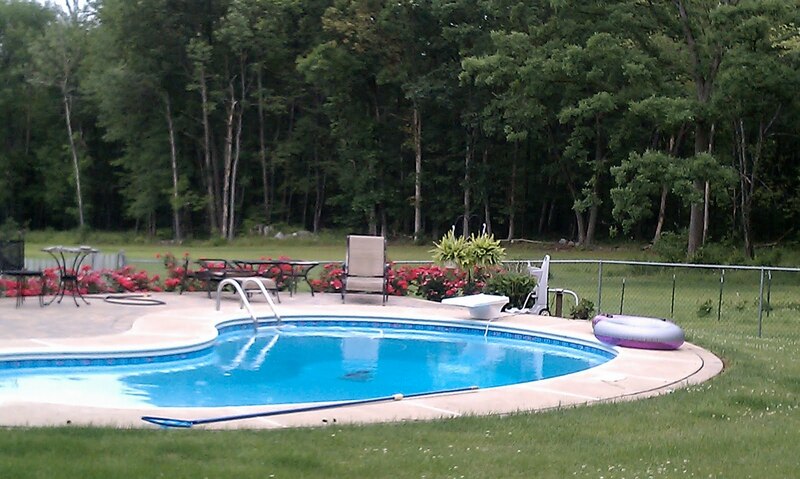 This is not what I wanted in mid June with my pool and flowers looking so good. 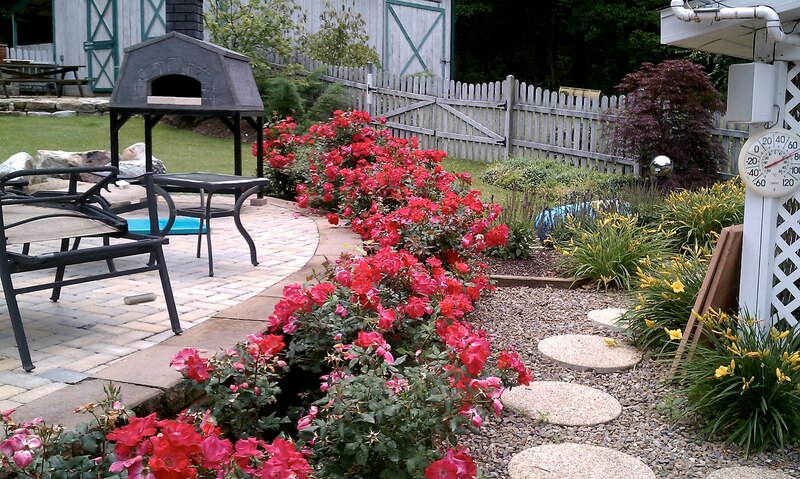 I am off from work and can't enjoy my vacation spot in my backyard! But with a little thought I decided this is perfect weather for soft pretzels in the brick oven! I usually wait until fall or late summer when the evening are a little cool for pretzel baking. I searched for my recipe and grabbed my recipe book and enjoyed the day anyway. I use a recipe I found on line for the dough and learned some good tricks from my book. The book is called The Pretzel Cookbook by Priscilla Warren . I like all the different types of pretzels and many different recipes in the book. I have made the dough a few times from the book and it is a nice dough and very easy. Today I made a copycat recipe from the internet that is similar to Auntie Annie's from the mall. Rolling the dough is fun and frustrating. The dough wants to shrink and we are still not good at a true pretzel shape. The rolled pretzel also must be dipped in baking soda and hot water and if it looked pretty before this dipping it does not look pretty after! 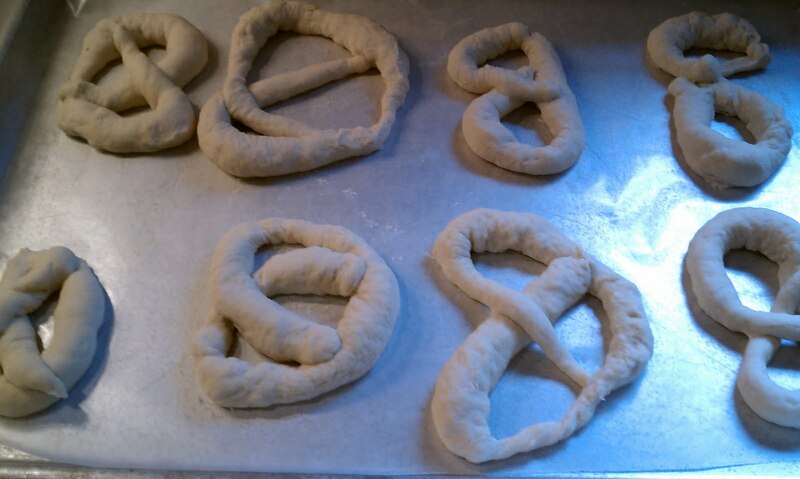 To transfer them from the baking sheet to the oven is another step that causes them to look even less like a pretzel. After they bake and puff up they do look look funny but the smell of fresh hot pretzels baking in your own backyard is unbelievable! 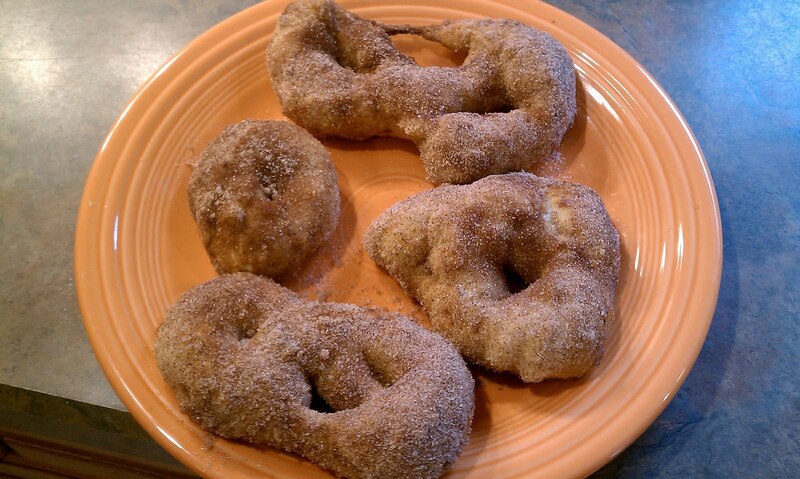 I like them best when they are dipped in melted sweat cream butter and covered in cinnamon and sugar after baking. I also dip the pretzels in butter and sprinkle with kosher salt for a traditional pretzel. I wish I knew someone who worked at a pretzel place and could come and teach me. Anyone out there willing to give me a few tips? So here is my recipe and some pictures. I hope you go ahead and try this yourself. 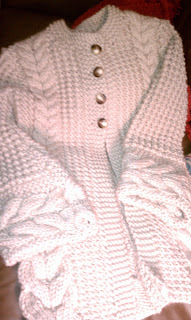 If they look better then mine let me know! I hope they taste as yummy as mine and you have as much fun as we do. You will need a Round Boy Oven to make them just like mine and remember I know where you can get one! 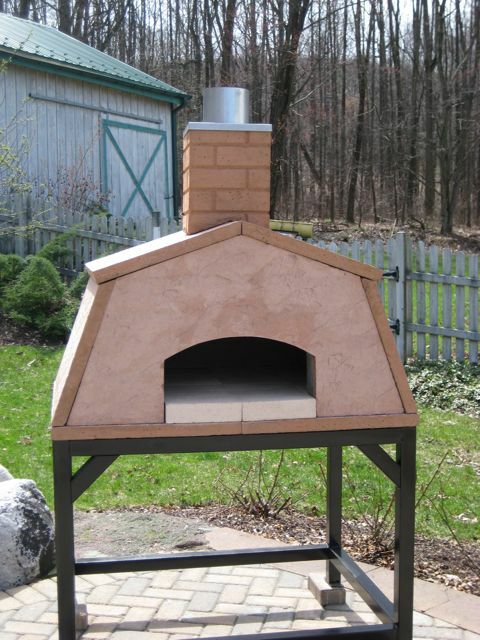 If you are interested in our ovens feel free to leave a comment and I will help you with your questions and how to purchase one. 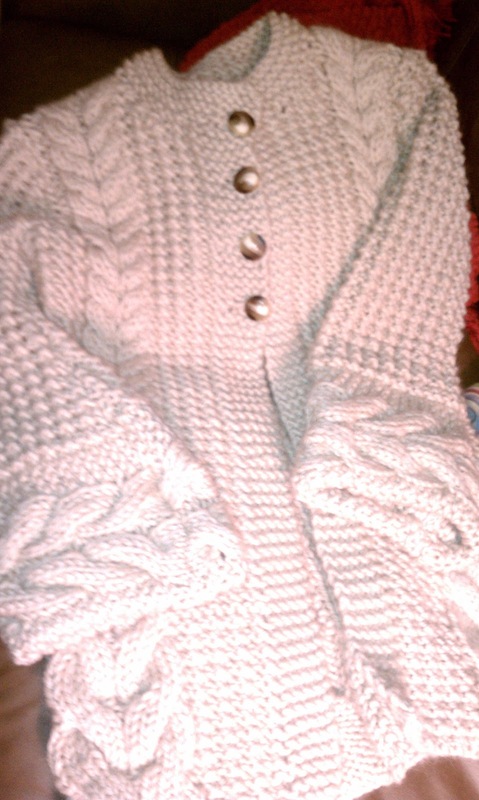 * The longer and thinner you can make the dough rope, the more like Auntie Annie's they will be.